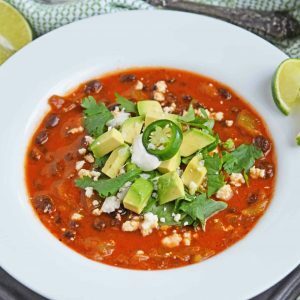 Black bean Green Chile Soup is a tomato based soup with smoky chipotle peppers and robust flavors. Top with avocado, cilantro and queso fresco! Hearty enough for an entree, but can also be an appetizer! In a large saucepan or Dutch oven, heat oil over medium heat. Add onions, saute for approximately 5 minutes, or until they are soft and translucent, but not browned. Add garlic, continue to saute and stir for 1 minute. Add chipotle chili through seas salt. Stir and bring to a simmer. Simmer for 15 minutes. Remove from heat. Using an immersion/stick blender or food processor, blend mixture until smooth. Return to stove on medium heat. Stir in green chilies and black beans. Continue to heat for 5 minutes. Ladle soup into serving bowls and top with crumbled queso fresco. Enjoy your Black Bean Soup and Green Chile! If you are using fresh Hatch chile, use two whole roasted and peeled chiles, finely chopped.